Matthew Holm is currently Director of Percussion Studies at Kent State University in Kent, OH where he teaches applied lessons, percussion methods courses and percussion ensemble. Dr. Holm was previously an instructor of percussion studies at Lamar University and the adjunct percussion professor at Sam Houston State University. Holm has performed with the Phoenix Symphony, Minnesota Orchestra, Baton Rouge Symphony Orchestra, Duluth-Superior Symphony, and the Orchestra of the Americas. As a concert marimbist, Dr. Holm has competed and performed internationally and makes many appearances at regional and national "days of percussion." Dr. Holm is also a strong advocate of new music and has performed with the Janus Percussion Duo, Penumbra Percussion Duo, Crossing 32nd Street, and the Arizona Contemporary New Music Ensemble (ACME). Matthew has studied marimba additionally with Nebojsa Jovan Zivkovic and has performed at three PAS International Conventions as an artist. From 2006-2009, he served as a faculty associate at Arizona State University where he was a director/arranger for the ASU Sun Devil Marching Band percussion section. As a member of the Cavaliers Drum and Bugle Corps, he contributed to three DCI World Championships (2000, 2001, 2002) an I&E gold medal, and a Fred Sanford High Percussion award. He has also worked with groups such as Wylie and Wylie East High Schools, Plano East High School, Rosemount High School (MN), Eastview High School (MN), Eagan High School (MN), Gilbert High School (AZ), and the Independent World Momentum Percussion Theater. 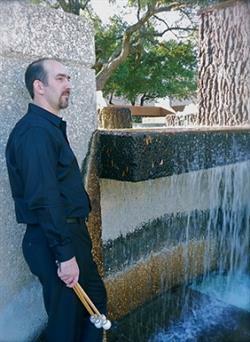 Dr. Holm served as both vice president and president of the Arizona Percussive Arts Society.